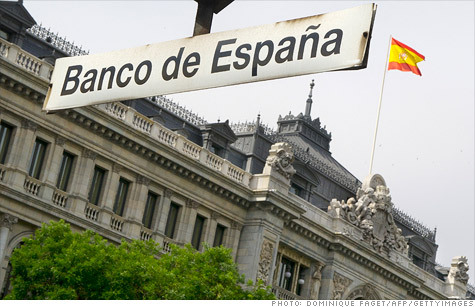 Spain has asked the European Union for up to €100 Billion (£80 Billion) to provide a capital buffer for the nation’s ailing banks. On Saturday, the Eurozone Finance Ministers agreed help Spain shore up its struggling banks and to lend up to €100 Billion. The announcement came in the wake of an International Monetary Fund report issued late Friday saying that several banks in Spain would need to raise capital buffers by a total of €40 billion (£32 Billion) to withstand another financial shock. Eurozone officials are eager to resolve the issue before the Greek Election on June 17, which could present another major turning point in the long-running European debt crisis. The US and the International Monetary Fund (IMF) have welcomed the move. The rescue package is expected to speed up the flow of credit loans, with the goal being to help the Spanish economy recover by recapitalizing insolvent banks so that those institutions can begin lending to companies and families. The Spanish economy looks bleak for the near future with the Recession in Spain seeing the economy expected to shrink by 1.7%. Source of the Funds – the money is expected to come from two sources – the European Financial Stability Facility (EFSF) and the European Stability Mechanism (ESM), which comes into force next month and will be formally requested at the next Eurozone finance ministers’ meeting. The problem being that investors have recently demanded higher and higher yields to lend to Spain. This has made it too expensive for the country to borrow the money needed for a bank rescue from the markets. The loan will be provided on very favorable terms. The conditions will only apply to banks and not the government, as Spain has asked for help with its banks, and that it has not requested a full-blown bailout. The deal is believed will help calm investors’ sentiment as it is a clear signal that the Eurozone takes decisive action in order to calm market turbulence and contain the contagion. This is hoped will help to put Spain on course for economic recovery and will assist with regaining investor and market confidence leading to necessary conditions to see a return to sustainable growth and much-needed job creation. The Counter-Argument being – Will it be enough? And will the loan be sufficient? The thoughts of some economists is the loan is still only prevention rather than cure. It will only have the effect of keeping the banking sector alive rather than really helping to resolve the issues and so leading to sustainable growth. On Saturday, IMF managing director Christine Lagarde said the plan for Spain should provide “assurance that the financing needs of Spain’s banking system will be fully met”. US Treasury Secretary Timothy Geithner said it was “important for the health of Spain’s economy and as concrete steps on the path to financial union, which is vital to the resilience of the euro area”. My concern being – global risks may be on the rise again. The Eurozone crisis continues to be the most immediate and most pressing threat, and there is the risk that conditions could get worse. A prudent and proactive investment strategy, diversification through asset allocation and product selection will help ease the situation and is planned to lead to a profitable outcome.